The playoffs didn't start out well for the Red Sox. Game One against the Oakland A's started at 10 pm Eastern time on a Wednesday night. Pedro Martinez threw a season-high 130 pitches in seven innings. Todd Walker's second home run of the night had given the Red Sox a 4-3 lead in the seventh, but Byung-Hyun Kim and Alan Embree let the A's tie it in the bottom of the ninth. Game Three starter Derek Lowe was called upon to pitch the eleventh, and he pitched well. In the twelfth, he ended up walking the bases loaded (the third one intentionally) before catcher Ramon Hernandez hit a bunt single to score the winning run. It was 2:45 am when the game ended. Just over thirteen hours later, the teams met for Game Two on Thursday afternoon. 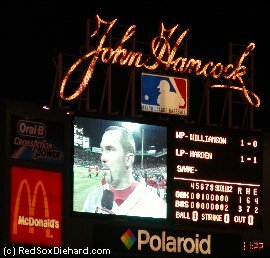 Tim Wakefield really only gave up one big hit - a double to Eric Byrnes that scored two runs - but the rest of the damage came from walks, a hit batsman, and Todd Walker's throwing error. The A's scored all five of their runs in the second inning, and the Sox only scored one. When I got to work Friday morning, the mood was somber. Everyone steered clear of me and knew not to mention what had transpired over the past two days. I wanted to be more excited about going to the playoff game the next day, but I was still upset about the first two games. I hadn't felt this depressed about the Red Sox since the game I had been to on August 20th, when the Sox stranded 17 runners as they lost to Oakland to fall 2 games back in the Wild Card race and 7.5 games behind the Yankees. But then I remembered that they had rebounded from that horrific loss with a 14-5 win against the A's the next day. In fact, their resiliency had become the hallmark of their season. They had bounced back so many times this year, especially at home. There was no way they were going down this easily. They would win tomorrow! 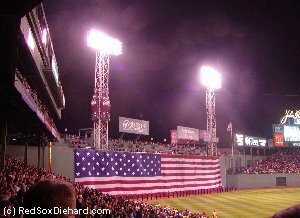 The Fenway Faithful - myself included - would see to that! Before I left work, I was telling everyone that Saturday's game was under control; I even predicted a 14-5 score. It was raining as we waited outside Fenway for the gates to open. The Boston Globe was giving away free rain ponchos as we entered the ballpark, and the Red Sox were handing out signs with the Sox logo on one side and "Let's Go Sox" on the other side. My seat was behind a pole in the grandstand in Section 27. 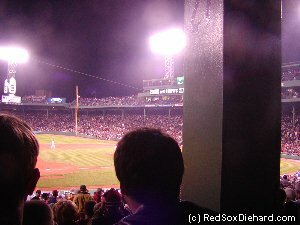 There are a lot of grandstand seats at Fenway where a pole blocks one piece of the field, but when they actually label a seat as "obstructed view", they mean it. Home plate was completely blocked, and when people were sitting next to me I wouldn't be able to lean over far enough to see. For now, there was nothing going on. It was still raining, and the tarp was over the field. A lot of cameras and reporters were lined up near the dugouts, as if preparing to broadcast pre-game shows, but no one was actually doing any broadcasts yet. I took the time to stroll around the park. Despite the fact that the Sox were down 0-2 in the series, the mood seemed light. I wasn't the only one who got the sense that this wasn't the end for the Sox. As it got closer to game time, I went to my seat. The woman next to me had come with her teenage son. I chatted with her briefly, telling her how my family and friends all tried to get playoff tickets online and over the phone, and this one obstructed view seat to this one game was all we were able to get. (Of course, I didn't care about the obstructed part. I was so excited to be there at all that I wouldn't have cared if it was turned backwards! But I did wish that my family and friends had been able to go.) The starting lineups were read prior to the official player introductions. Derek Lowe was starting for the Red Sox tonight, with Ted Lilly going for the A's. The Sox batters would be Johnny Damon, Nomar Garciaparra, Bill Mueller, Manny Ramirez, David Ortiz, Kevin Millar, Jason Varitek, Gabe Kapler, and Damian Jackson. Trot Nixon was still not fully recovered from his calf injury, so with a left-hander pitching for Oakland tonight, he was being rested, but he'd be available to pinch-hit later if needed. Jackson got the start at second instead of Todd Walker, because Grady Little was sticking to what he had done all year, using Jackson whenever sinkerballer Lowe was on the mound. When the game finally started, Lowe set Billy McMillon, Erubiel Durazo, and Miguel Tejada down in order in the first. The final out was a grounder back to Lowe, who tagged the runner himself for the out. As he walked off the field, we stood up to applaud as if he had just finished the eighth. Damon doubled and Garciaparra walked to start the bottom of the first, but Lilly got three straight strikeouts to get out of the inning. In the second, Lowe needed only seven pitches to dispose of Eric Chavez, Ramon Hernandez, and Scott Hatteberg on ground balls. It didn't look as if the two innings of work in Game One was having any ill effect on him. He had pitched really well at home all season, and that was bound to give him some added confidence. Millar started the Red Sox second with an infield hit, and Varitek reached on an error by Tejada at short. Kapler hit a grounder to third. Chavez stepped on the bag to force Millar, but threw wildly to first and Kapler was safe on the A's second error of the inning. Then Jackson hit another grounder to Chavez, who appeared to have Varitek caught in a rundown. I couldn't see the play, because the pole was in the way, but next thing I knew Tek was scoring. The scoreboard said "FC E5" but I hadn't noticed any error, and thought maybe they accidentally posted the scoring of the previous play again. It turned out that the umpire had called interference on Chavez, which is where the E5 had come from, and Varitek was awarded the plate. Damon flied out and Nomar popped up to end the inning. When it was over, the Sox had a 1-0 lead, but with three Oakland errors in the inning, it could have been a lot more. Lowe got Mark Ellis and Terrence Long to ground out to start the third. Byrnes became the first Oakland batter to reach base when he beat out an infield hit. Then with an 0-2 count to McMillon, Byrnes broke for second. The throw went into center field and Byrnes went to third, but the pitch wound up being called strike three, so it didn't matter. We jumped up for another standing ovation as the Sox players jogged off the field. Mueller, Manny, and Ortiz went in order in the third, and then Lowe got Durazo, Tejada, and Chavez to go 1-2-3 in the fourth. In the bottom of the inning, Millar reached on an error when Ramon Hernandez dropped his popup (Oakland's fourth error of the night) but he was stranded. The first out of the fifth was a liner right back to Lowe. He made a nice catch, and we all jumped up to applaud again. Hatteberg hit a single (the first ball out of the infield for the A's) but Ellis and Long grounded out to strand him. By now, we were jumping up to cheer for every out. In the Red Sox' fifth, Damon was hit by a pitch leading off, but Nomar erased him on a double play, and Mueller struck out to end the inning. Eric Byrnes led off the sixth with a single. He stole second and moved up on McMillon's groundout before Durazo walked. Tejada hit a grounder to Lowe, who threw home to get Byrnes trying to score. The throw went past Tek, who was blocking the plate. I assumed Byrnes had scored, because I couldn't see home plate. I also didn't see him hopping around on one foot after his collision with Varitek, but I did see Tek pick up the ball at the backstop and then run over and tag Byrnes, who it turned out had missed the plate. Lowe was charged with an error for the throw, and Tejada wound up on second base. Chavez was intentionally walked, and the next play was the strangest of the night. Hernandez hit the ball past Nomar for an error. It went into left field, and Durazo scored from third. Chavez tried to score all the way from first, but Bill Mueller got in his way as he got to third. The umpire signaled obstruction, but did not think that he would have scored if he had not been interfered with. Awarding an extra base for obstruction is at the discretion of the umpires, but Tejada assumed that he would be given the plate. When he stepped off third, Tek tagged him out to end the inning, prompting a huge argument from Tejada and the rest of the A's. 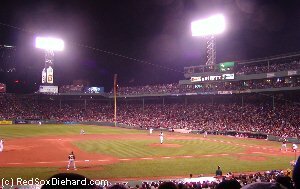 The scoreboard said "FC E6 7-2" (Hernandez was credited with a fielder's choice and reached on Nomar's error, and Tejada was out 7-2) but I hadn't been able to actually see it, and they don't replay controversial plays on the message board. People saw my scorecard and asked me what was going on, but I hadn't seen a thing. (In an inning like this, though, I would have been confused even if I could see!) What we did know for sure was that we had benefited from a strange call, and while the game was now tied, we were even more fired up than we had been before. Millar walked with two outs in the sixth, but Varitek grounded out to end the inning. After Lowe got Hatteberg to ground out to open the seventh, the next three batters hit singles to load the bases. Damian Jackson made a great catch of a line drive for the second out, and we gave him a standing ovation. We stayed on our feet as Johnny Damon caught Durazo's fly to end the inning, so we were already standing for the seventh inning stretch. We actually got to sit back down for a few minutes when the Sox went down 1-2-3 in the bottom of the seventh. Mike Timlin came in to start the eighth. His first pitch resulted in a fly out to right. Back on our feet again! Timlin made a great play on a comebacker to the mound to retire the next batter (up we go again!) and then got Ramon Hernandez to fly out to the warning track for the final out of the inning. We gave him another huge ovation as he walked off the field at the end of the inning. Chad Bradford came in to pitch for the A's, and Nomar started the eighth inning with an infield hit. As he moved to second on Mueller's grounder, someone near me asked, "Is that Pedro?" Sure enough, out in the bullpen, The Best Pitcher on the Planet was warming up. It looked like if the Sox took the lead this inning, he'd pitch the ninth. We already seemed to be at maximum intensity, so I wondered how we'd be able to turn it up another notch if he actually entered the game! We didn't get to find out though, because Manny struck out, Ortiz was intentionally walked, and Millar went down on strikes to end the threat. Timlin was back for the ninth, and now we jumped up for every strike one, standing more than sitting. He set the A's down in order again, and it was on to the bottom of the ninth. Now I knew we were going to win! I wasn't sure how or in what inning, but these last at-bat Fenway wins were their specialty. Varitek singled and was replaced by pinch-runner Adrian Brown. But Kapler hit into a double play and pinch-hitter Todd Walker popped up to end the inning. On to the tenth, and Timlin's third inning of work. We were on our feet as he struck out Byrnes. After ball one to McMillon, we sat back down, but he flied out to center on the next pitch, and we hopped right back up again since there were now two outs. "Up we go again," said the woman next to me. "Right," I laughed. "My question is why we actually sat down!" Timlin got another strikeout, ending three perfect innings of work. The Red Sox got two runners on in the bottom of the tenth, when Nomar singled and stole second, and Manny was intentionally walked, but Ortiz lined out to short to end the inning. Scott Williamson came on for the eleventh. He struck out Tejada, got Chavez on a fly to left, and struck out Hernandez. Millar popped up to open the eleventh. Doug Mirabelli had come in to catch in the tenth after Varitek had left for a pinch-runner in the ninth, and he hit a single. Trot Nixon came in to hit for Kapler. With a 1-1 count, he launched one into center field, and the rest felt as if it was happening in slow-motion. First I thought it looked playable, and I was muttering, "Don't catch it, don't catch it." It kept carrying and looked like it would be over the centerfielder's head and off the wall, and I switched to, "Run, Trot, run!" But it kept going, landing in the bleachers! We went crazy in the stands, jumping up and down and screaming. Trot circled the bases and was met at home plate by his teammates. I took a step toward the aisle, just to see better, when I felt a tap on my shoulder. I turned around and the woman next to me gave me a big hug. A guy walked past in the aisle with his arms raised in triumph, and I reached out and high-fived him. We all stayed, clapping and cheering, as Trot's post-game interview was shown on the Jumbo-Tron. When he finished, we still didn't want to leave. Everyone stayed, while the grounds crew came out and put the tarp back on the field, and fans finally started trickling out only after it was apparent that nothing else was going on. I hadn't been able to get tickets to any more postseason games, so this was my last look at Fenway. It was only 11:30, and the T runs until 1 am on Saturdays, so I didn't have to rush. I sat down in a nearby seat. 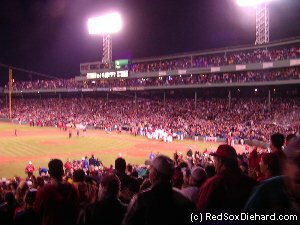 The Red Sox' season would live for another day, but this was my last day at Fenway in 2003. It had been the most fun season I'd ever been able to go to, and it ended on a great note. I waited a few more minutes, took one last look around, and left knowing that these 2003 "Cowboy Up" Red Sox were not going to let anything stop them. I still haven't recovered from what happened next. David Ortiz hit a big double in the eighth inning the next day to win Game Four for the Sox. They headed back to Oakland on Monday, where they won 4-3 in a very dramatic Game Five. In the ALCS, they faced the Yankees. Tim Wakefield outdueled Mike Mussina in Games One and Four. John Burkett gutted out a solid performance in Game Six to force a deciding Game Seven the following night. The Red Sox got off to a good start, knocking Roger Clemens out after three innings, and taking a 5-2 lead into the eighth. After retiring Nick Johnson for the first out of the inning, Pedro allowed a double and a run-scoring single. (You'll know from reading this that I'm a huge Pedro fan, and had been a proponent of letting him pitch longer into games all season long. But the examples I had used all year long involved low pitch counts and an unreliable bullpen. In the playoffs the bullpen had been outstanding, and Pedro had already thrown 100 pitches before the inning started and was up to 115 when the first run scored. Even I assumed Grady Little was coming out to take him out of the game. I was all set to give him a standing ovation from my living room for a job well done.) But Grady left him in, and though Pedro had two strikes on every batter in the inning, Hideki Matsui and Jorge Posada doubled, tying the game. Alan Embree and Mike Timlin finally got the call, and got out of the eighth. Timlin pitched the ninth, and Wakefield came in in the tenth. Mariano Rivera held the Sox scoreless through the ninth, tenth, and eleventh. Wakefield opened the bottom of the eleventh by striking out Aaron Boone on a nasty knuckleball, then followed with strikeouts of Karim Garcia and Alfonso Soriano. In the top of the twelfth, Rivera was done for the night. Jeff Weaver came in for the Yankees, and got two quick outs. Nomar hit a grounder to third, which would have been the final out of the inning, but Aaron Boone booted it, and Nomar was safe. Manny followed with a double, and Gabe Kapler, who had pinch-run for David Ortiz earlier, doubled both runners home. Kevin Millar singled, scoring Kapler, and then Nixon and Mueller walked to load the bases. Doug Mirabelli hit a drive deep to left field, inches from going out. He was almost thrown out at third, but Boone had trouble applying the tag. Mirabelli was safe with a triple, and the Red Sox had an 11-5 lead. Wakefield stayed in for the bottom of the twelfth, but the Yankees scored three runs to make the score 11-8. Scott Williamson was called in to put out the fire, and had no trouble recording the final out. Wakefield wound up with his third win of the series, and Williamson saved all four of the Red Sox' wins, so the two shared MVP honors. If you enjoyed my accounts of the 2003 season, you'll love Feeding the Green Monster by Rob Neyer. It was reading his book about the 2000 season that inspired me to write about my experiences in 2001-03. You can read the first chapter online by following the link below. This page and all photos copyright © 2003-2004 by Kristen D. Cornette.